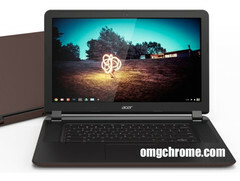 Acer is reportedly planning to release the world's first 15.6-inch Chromebook at some point next year. The company will offer the device in multiple configurations, including a version with an Intel Broadwell U processor and a fullHD display. Although notebook and desktop PC sales have declined considerably over the past few years, Chromebooks have become increasingly popular, a feat that was made possible mainly thanks to their low retail prices. While most Chromebooks have been entry-level devices with inexpensive processors and display sizes ranging between 11 and 13 inches, Acer is rumored to be working on the world's first 15.6-inch Chromebook. According to OMG Chrome, the Acer C910 will come with some serious processing power and will be marketed as the ideal "Teacher's Chromebook". The Acer C910 Chromebook is said to feature either an Intel Broadwell U Celeron processor, or the more powerful Core i3 processor. When it comes to the display, rumors suggest that Acer will allow its customers to choose between a display with a resolution of 1366 by 768 pixels, and one with a resolution of 1920 by 1080 pixels. Both displays will feature an anti-glare coating, but sadly they won't be IPS panels, just regular TFT ones. Other rumored specifications for the Acer C910 Chromebook include 2 or 4GB of RAM, 16 or 32GB of internal storage space, 802.11ac WiFi, Bluetooth 4.0, an USB 3.0 port, and an HDMI out port. The Acer C910 Chromebook is expected to be officially launched in March 2015, but at the moment we don't have any information regarding the price of the world's first 15.6-inch Chromebook.